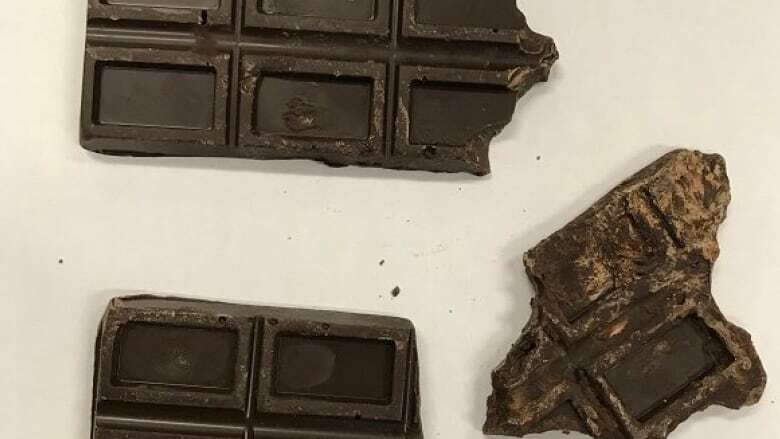 A Brandon, Man., mom whose two children were taken to hospital long after eating part of a cannabis-infused chocolate bar says she would have handled the situation differently had she known the outcome. A Brandon, Man., mom whose two children were taken to hospital long after eating part of a cannabis-infused chocolate bar says she would have handled the situation differently if she'd known how badly her two-year-old daughter would react. And while one doctor says he's surprised by the girl's physical reaction, another says children should be taken to hospital immediately if a parent thinks they've consumed a cannabis edible. "I would never want it to happen again," the mother of the two children told CBC News at her home on Tuesday. The woman, whom CBC News has agreed not to identify because she fears for her safety and that of her children, said she still isn't sure how her kids got into the chocolate on the morning of Feb. 2. The single mom said her son, 5, and daughter, 2, woke up around 9 a.m. She said she had woken up earlier, but fell asleep again after bringing her third child into bed with her earlier in the morning. She said she didn't wake up again until she heard noise elsewhere in the home, and discovered what had happened. "I had called my mom [after] it happened and she came over to help me through it," she said. The woman said her son somehow got into a kitchen cupboard above the stove where the edibles, along with other medication such as antidepressants and antibiotics, were kept. Purchasing or selling edible cannabis products is still illegal in Canada, but making them at home is allowed under the current legislation. The woman said she had the edibles in her home because they help with her post-traumatic stress disorder. Her son took the chocolate bar — which she says contained 750 mg of THC — back to the family's living room, where he and his sister ate some of it. The woman doesn't know how her son climbed on the counter and reached the cupboard in the first place. She said the kids didn't get into the other medications and she's not sure exactly sure how much chocolate the kids ate. "I always keep that stuff up and out of reach," she said, when asked if it could have been left out on a counter by accident. "I would never intentionally put my kids at risk of getting into anything." She said she and her mom observed the kids. Both seemed tired and the boy threw up, but they otherwise appeared to be fine, she said. Six hours later, around 3 p.m., she said her daughter had a seizure and an ambulance was called. The girl was taken to hospital in Brandon and later transferred to the children's hospital in Winnipeg, just over 200 kilometres east, after suffering more seizures and swelling in her brain, according to the woman. The girl was kept in a coma with a breathing tube until Sunday. "I was just hoping that she would be OK," said the woman. "I was scared … what if she didn't pull through? I knew for her I had to be strong and it was just really terrifying for me." The girl's condition improved and she was discharged on Feb. 5. 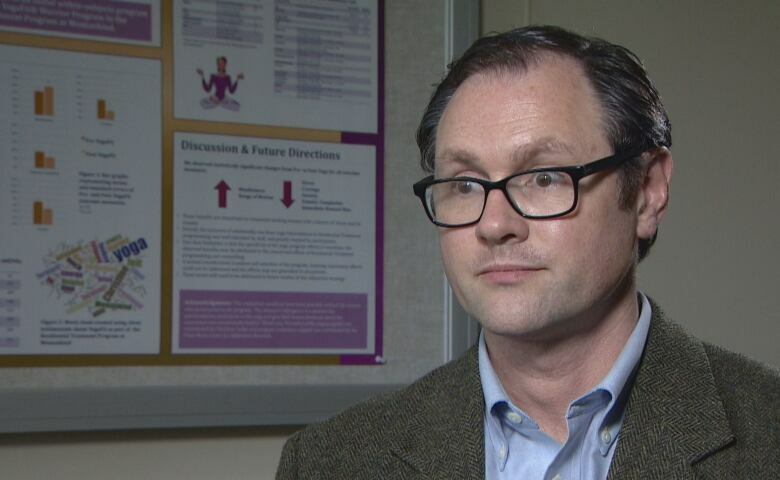 James MacKillop, who has studied cannabis as the director of the Peter Boris Centre for Addictions Research and the DeGroote Centre for Medicinal Cannabis Research in Hamilton, said while adverse reactions can occur, seizures and swelling of the brain are atypical symptoms from consuming too much cannabis or edibles. "I am surprised by the report of seizures, which are not a common symptom of cannabis overdose," he told CBC News in an email. "Seizures have been reported in relation to synthetic cannabinoids," he said, but those are not typically in edibles. "In general, cannabis and particularly CBD from cannabis has been associated with anticonvulsant properties," he added. 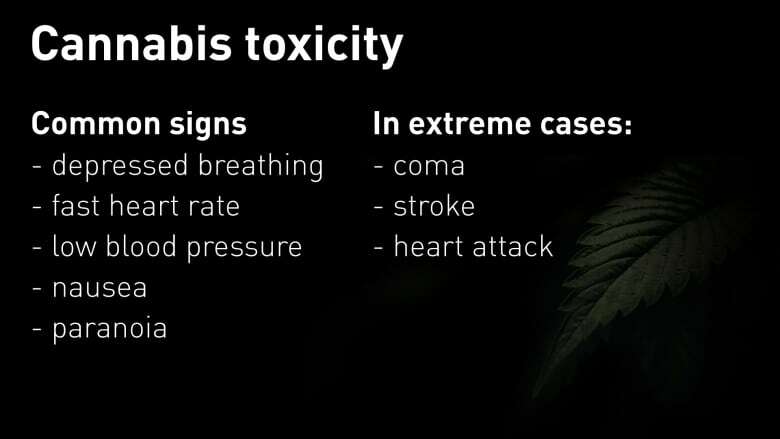 But Dr. Margaret Thompson, an emergency physician and medical director of the Manitoba, Ontario and Nunavut Poison Centres, told CBC News the girl's symptoms aren't uncommon, especially for someone who has never consumed cannabis before or for someone so young. "The dose makes the difference," said Thompson, who is also a toxicologist. "Depending on how much cannabis is in a particular edible, you might expect no symptoms all the way up to seizures." Thompson said people may also experience depressed breathing, low blood pressure or even fall into a coma. First-time users, including children, are more susceptible, said Thompson, but she doesn't known of any case where a child has died because of cannabis consumption. "Any person who is naive to the effect of cannabis will [feel] an effect that is maybe not expected by them," she said. "Certainly a two-year-old would not know what this high feeling is. They would not be able to describe it to a parent." The Addictions Foundation of Manitoba has, in the past, said parents should be proactive by talking to kids about cannabis and its effect early on, rather than waiting until there is an issue. Thompson said children should be taken to hospital as soon as possible after consuming products like edibles. The mother of the affected children said if she had known her daughter would react that badly, she would have taken the kids to the hospital much sooner. "How can you know what you're supposed to do when it's your first time doing this?" she said. "I thought I just had to wait it out. That was my own lapse in judgment," she added. "I don't give any excuse [for] that." She said Child and Family Services did investigate the incident, along with Brandon police, but no charges have yet been laid. Police earlier called the situation an "unfortunate incident." The woman said she will keep the edibles locked up in her bedroom from now on and urges other parents to do the same. "I really hope other people that have this stuff in their house learn from this." An earlier version of this story mistakenly said the children consumed part of a 750 mg chocolate bar. In fact, the children's mother said the bar contained contained 750 mg of THC but didn't specify how big it was.